See that tape measure in the background? I used that to measure the buns. A weekend breakfast around here tends to be waffles, omelettes, or some combination of eggs+bacon+hash browns. 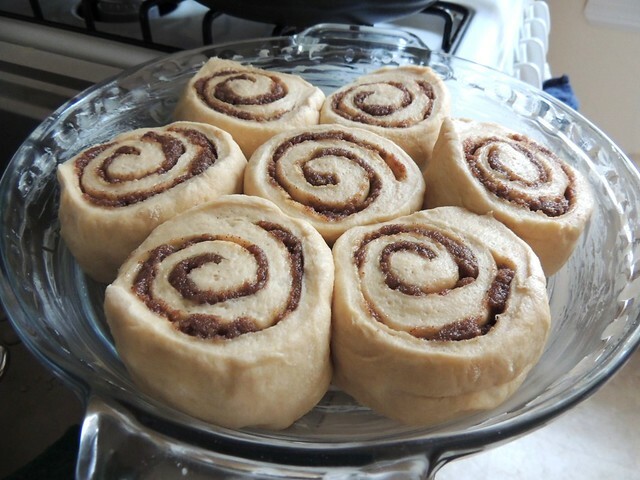 This past Saturday, though, all I could think about were cinnamon rolls, especially after seeing a recipe for 1-hour cinnamon rolls Tiffany had posted. How can you go wrong with a recipe that takes around an hour to make? I'm sure it took me a little longer since I dawdle. - Kneading the dough with the dough hooks on my hand mixer (thanks, Mom!). I didn't feel like getting my hands dirty and I don't have a stand mixer. 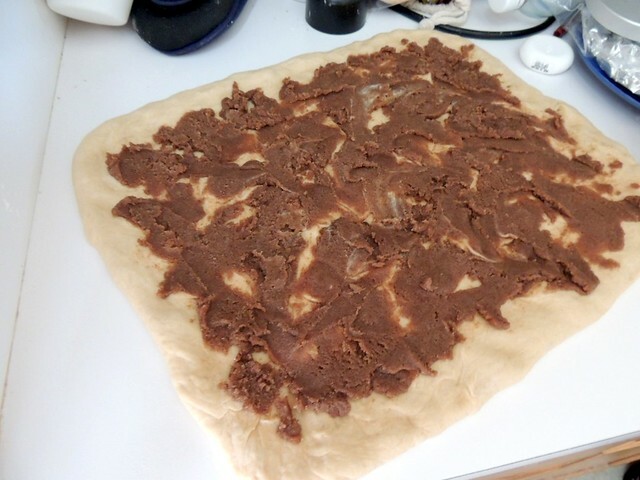 At first, I didn't really trust that it would actually do a good job, but after 10 minutes on high the dough was smooth and just barely tacky. I'm not sure I'd use the mixer to knead larger batches of dough, though I'm glad I have the option. - Used around 1 1/4 cup white whole wheat flour since I ran out of all-purpose, which makes these unintentionally healthier than the original. They were still incredibly tender (more on that later). 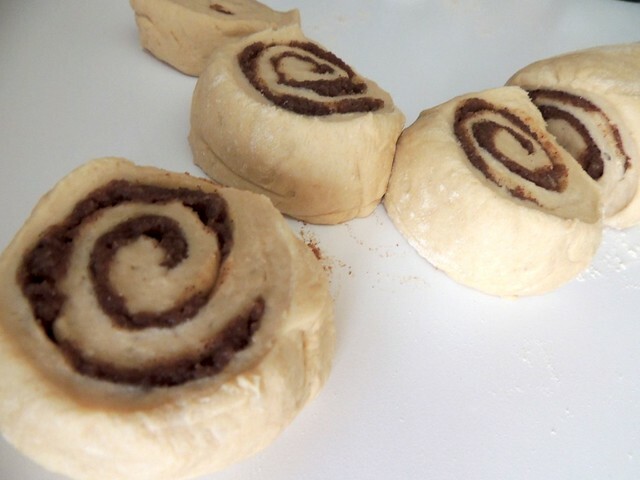 - Rolled out the dough longer than the recipe said to. I do this so that I get more turns, which make the finished rolls look prettier. - Used half the called for cinnamon, not on purpose but because that's all I had. Unless you have really strong cinnamon (some varieties are stronger than others), use the full amount, as these tasted a little more sweet and less cinnamony because of it. The filling (consisting of white sugar, brown sugar, and cinnamon) is supposed to be sprinkled on the butter, but I mixed it in with the butter and spread the cinnamon-sugar butter on the dough. It made rolling the dough up easier. 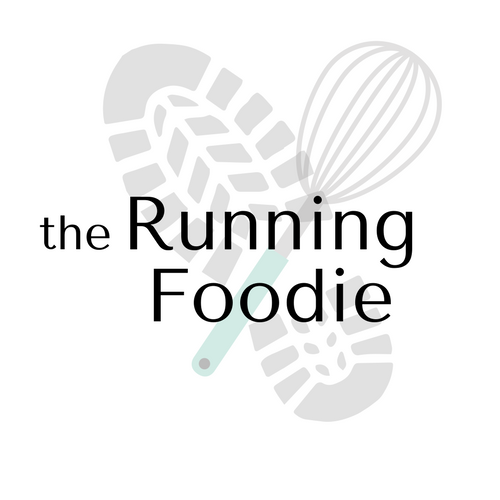 - Since the butter for the icing was already softened, I made the icing buttercream style (by beating the confectioner's sugar into the flour before thinning with milk). This was just to avoid the step of melting the butter, not because I thought it made a better icing. 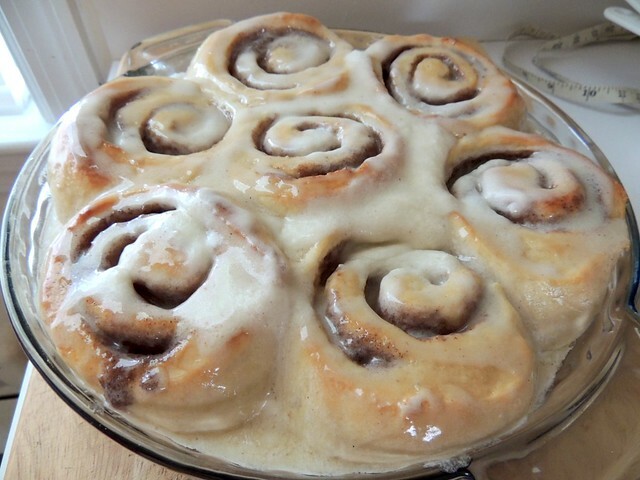 Since I spread the icing on top of the rolls while they were still warm, it melted and made a thin glaze rather than retaining its shape in nice drizzles. But it tastes the same. 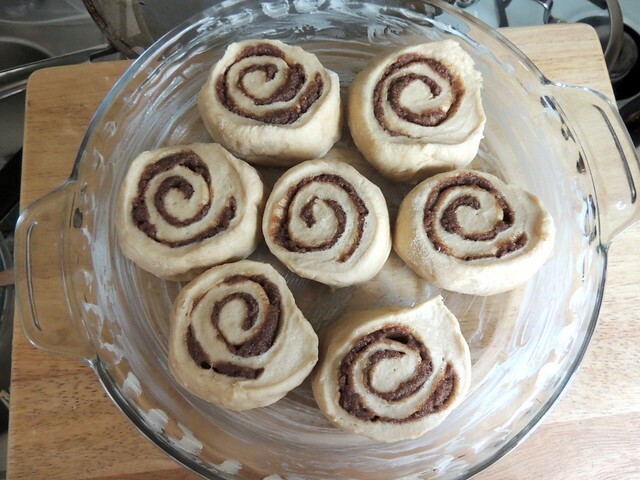 These are the rolls just 25 minutes after rising. You can see how the texture of the dough is very light and spongy. This is after baking. The rolls are just golden brown and baked up nicely. A bit of the filling oozed out on the bottom. Fortunately, the centers still retained the majority of the filling, which is good because sometimes the outer edges can get bland. Most cinnamon rolls I made tend to be chewy, bready, or in the case of the croissant-like pumpkin cinnamon rolls I made a while ago, flaky. These rolls, however, were so incredibly tender that I was reminded of the Pillsbury cinnamon rolls that come in the tube. No, that's not a bad thing. 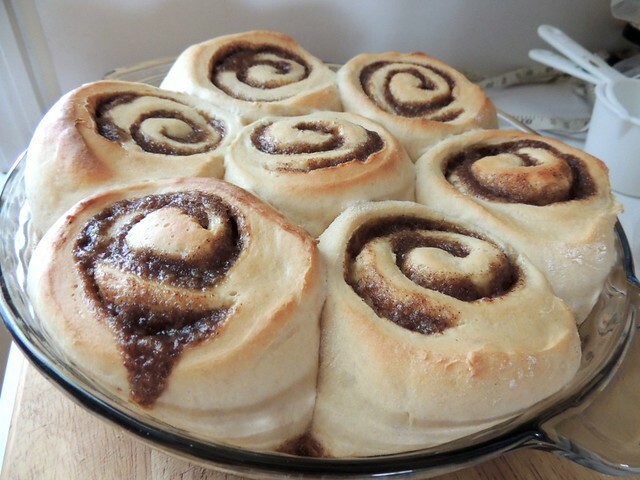 I've always liked those cinnamon rolls even though they tasted a little fake. Seriously, these were so tender, they almost seemed like biscuit rolls but with more heft. Okay, no, they weren't at all like biscuit rolls. They were a little on the sweet side, which I think would have been offset if I had used the correct amount of cinnamon. The centers were glorious and, of course, my favorite part. I'm definitely making these again, no doubt about it. Do give it a try, Eric! These look delicious! I love having big breakfasts on the weekends. Me too, Melanie. I seem to prefer weekend breakfasts on the sweet side, unless I'm making hash browns. Welcome to Collective Bias! I must pin this recipe!!! 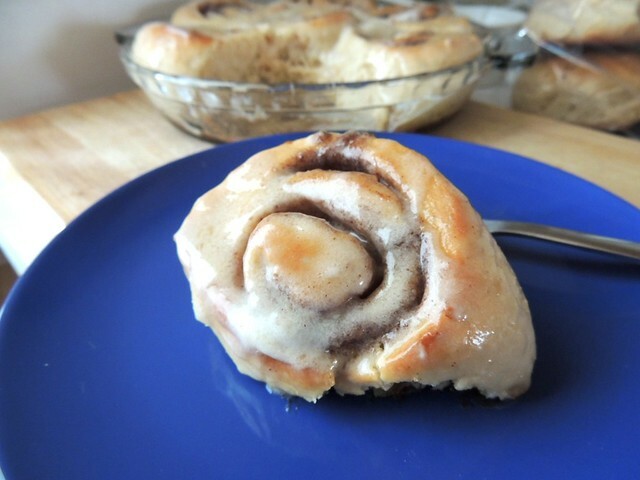 These rolls are making me hungry!! Just stopping by to welcome you to the Social Fabric Community!